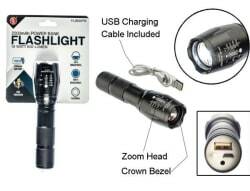 As one of its daily deals, 13 Deals offers this 500-Lumen Rechargeable LED Flashlight / 2,200mAh Portable Battery Pack for $12.49 with free shipping. That's a buck under our December mention, $13 off, and the lowest price we've seen. It features three light modes, a zoom head, and glow-in-the-dark tactical switch. Deal ends February 4.